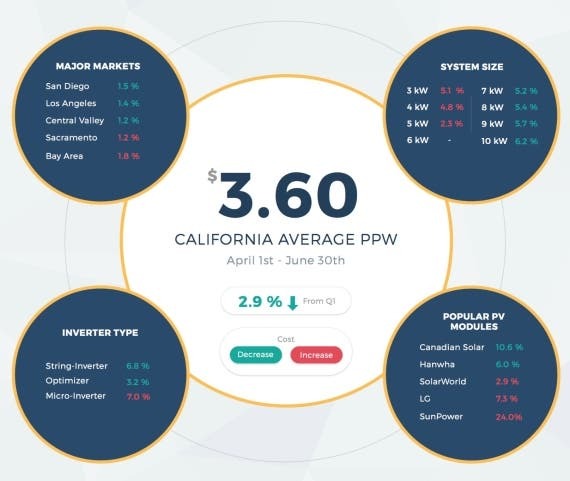 The online solar marketplace Pick My Solar has released its own report on the California solar market after finding “large discrepancies” with the data from the California Solar Initiative (CSI). According to Pick My Solar, the average cost-per-watt data from CSI is off by 39%, at least partly due to what it calls “exhausted utility solar rebates” that have kept the CSI data out of date. Pick My Solar’s first data report on the California solar market, which covers the second quarter of 2015, was built using data from bids placed on the company’s bidding platform, as well as from bids analyzed through Pick My Solar’s free “quote advising service.” The report found that the average cost of residential solar in the state of California has dropped to $3.60 per watt (down 2.9% from Q1), as opposed to the $5.32 per watt stated on CSI’s statistics page, and an additional drop of 2.5% in cost per watt for residential solar is predicted for Q3.